Rusted patina is one of my favorite looks!! I actually got the inspiration for this project from a rusty green pipe the other day!! Nailed it!!! I get inspiration from EVERYWHERE!! The other day I was offloading some things at our local transfer station and what do my eyes see? A cool green rusted metal pole! Yup something that I have probably drove by hundreds of times. Today though, it was my inspiration and now you get to see how I brought this idea to fruition. So now without further ado an awesome rusted patina paint finish, check it out! Before I move on, I need to give you a list of supplies I used for this project! 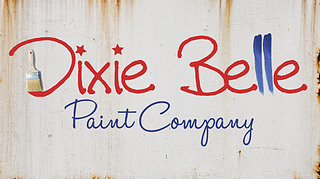 Order Your Dixie Belle HERE!! The first thing I did was clean my piece thoroughly with Dixie Belle’s White Lightening. After I cleaned my piece really well I painted two coats of Holy Guacamole!! Surprisingly it’s a rich earthy mossy toned color. Perfect for this project and one I WILL be using more often!! I used my flat medium synthetic brush from the Dixie Belle synthetic brush line. They are the BEST synthetic brushes i have EVER used! The patina line is my favorite! The quality and quantity you get is great for the price and a little goes a longggg way! Iron Patina Paint creates a rusted patina look. You can use either patina spray but my preferred spray is the green spray. It gives a more bright and brown rusty look. For this is put the iron paint in the areas I wanted it. Your first coat needs to dry. I then laid the piece on its back for the second coat of paint. You need to spray the green patina spray on the iron paint while it is still wet. Check out that rusted patina forming below!!!! I did the spray for this then actually walked away and didn’t come back until the next morning. The rusted patina takes a little longer to fully take effect buy holy guacamole check out what I found in the morning! This wasn’t the final look I wanted but it was a huge part of this process! So the next step was to get so texture going on this piece. I first put some of the Coffee Bean and water into a Tupperware container and mixed it really well. Once I mixed the paint and water, I then added a scoop of the Sea Spray in a little at a time. You will want a pancake batter consistency for this part. Now that we mixed up the Sea Spray and Coffee Bean mixture, I randomly placed it in spot brushing down and blotting for more texture. Wait for this to dry. Are you getting excited for this rusted patina finish yet??? Okay so once your texture part is dried, you will add the Copper Patina Paint. Remember my inspiration was a green rusty pole. Holy Guacamole does an amazing job of capturing the green but nothing ties that all in like some green patina. Am I right?!?! I randomly places the Copper Patina Paint in places I thought would look cool and make sense. Now remember with the patina line, the first coat needs to dry. Then you do your second coat and while it is still wet you want to spray the activating patina spray on the paint. I used the green patina spray for this. Clearly you cannot have a cool rusted patina piece with out a little rust crust and drippiness right? Those are my rules anyways. So here is the next step. Use a separate container and put some Iron Patina Paint in. Make sure to move it around so the paint is evenly dispersed. Then I sprayed a bunch of the green patina spray in with the paint. I mixed them together with a cheap chip brush. It will get chunky at first but keep mixing and it will smooth out. Rusted Patina Crust and Drips! So here is where you will add the rust crust (I made that up, cool right?) and rusty drips! I used the mixture and dabbed different areas ABOVE where I had put the copper patina. So i makes little crusty areas BUT also drips down…see how cool. Also check out that copper patina activating!! Now here it the part where you need patience. Also I got a little in the zone and forgot to take some pictures but that is okay because you can put your own touch and spin on your own piece. I used the Prima Marketing Artisan Powders and Waxes listed above. Also I used the Dixie Belle Gilding waxes for this part. I have a video I have created on how to use the Prima Marketing Artisan Powders. Check it out below. The last part is really your preference on where you want the waxes and powders to go. I randomly placed them but also made sure it made sense where they were placed. Check out the FINAL product BELOW!! CtysDawna, you can tell you definitely know what your doing. Awesome pieca. Thank you Darla you are so sweet!! thanks for being so unselfish and sharing your talent with us.. I cant wait to try this!! This is amazing! I’ll reiterate Melanie’s comment above. Thank you so much for sharing your vision and talents. What a blessing! Best thing EVER! Please don’t stop posting. Good luck on your move! Hope everything works out and everyone is happy! This will always be one of my favorite pieces. When I saw the before I thought I think I have the cousin of this piece. Thanks for the great tutorial. So off to Germany for a few years. I believe I read that you will coming home to Maine…is that right. Well have an awesome adventure. If you ever put together a container of furniture from Europe I would be interested in taking part. I live in Maryland so it is on the east coast. Take care. Please keep sending out news and pictures.